The 2019 Hemmings Motor News Great Race presented by Hagerty will start in Riverside, Calif., on Saturday, June 22, and finish is Tacoma, Wash., on Sunday, June 30, race organizers have announced. This marks the first time the Great Race, the worlds premiere old car rally, will start and finish on the West Coast. 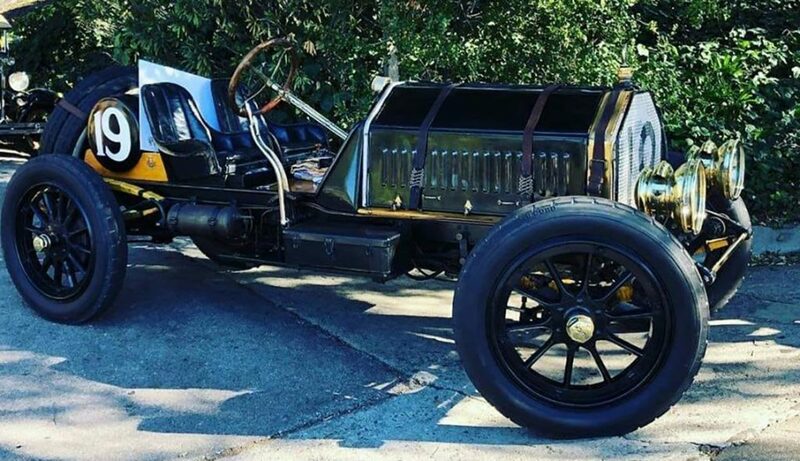 The 9-day, 2,300-mile adventure will bring 120 of the worlds finest antique automobiles to 18 cities in California, Nevada, Oregon and Washington. More than $150,000 will be awarded to top finishers in multiple divisions. We are excited to start the 2019 Great Race in Riverside, director Jeff Stumb said. Especially with Riversides great connection and long history of racing at the old Riverside Raceway. It will be the first time the event has been to Riverside since a 2001 overnight stop. Teams and cars from Japan, England, Australia, Canada and every corner of the United States will converge in Riverside in mid-June with vintage automobiles dating back as far as 1916. Overnight cities along the 2019 route are scheduled to include Lancaster, Calif.; Gardnerville, Nev.; Chico, Calif.; Eureka, Calif.; Grants Pass, Ore.; Bend, Ore.; Vancouver, Wash.; and Olympia, Wash. Lunch cities are scheduled to include Victorville, Calif.; Bishop, Calif.; Grass Valley, Calif.; Ukiah, Calif.; Brookings, Ore.; Crater Lake, Ore.; Hood River, Ore.; and Longview, Wash. The Great Race, which began 36 years ago, is not a speed race, but a time/speed/distance rally. The vehicles, each with a driver and navigator, are given precise instructions each day that detail every move down to the second. They are scored at secret check points along the way and are penalized one second for each second either early or late. As in golf, the lowest score wins. Cars start  and hopefully finish  one minute apart if all goes according to plan. The biggest part of the challenge other than staying on time and following the instructions is getting an old car to the finish line each day, organizers say. Each stop on the Great Race is free to the public and spectators will be able to visit with the participants and to look at the cars for several hours. It is common for kids to climb in the cars for a first-hand look. Cars built in 1974 and earlier are eligible, with most entries having been manufactured before World War II. 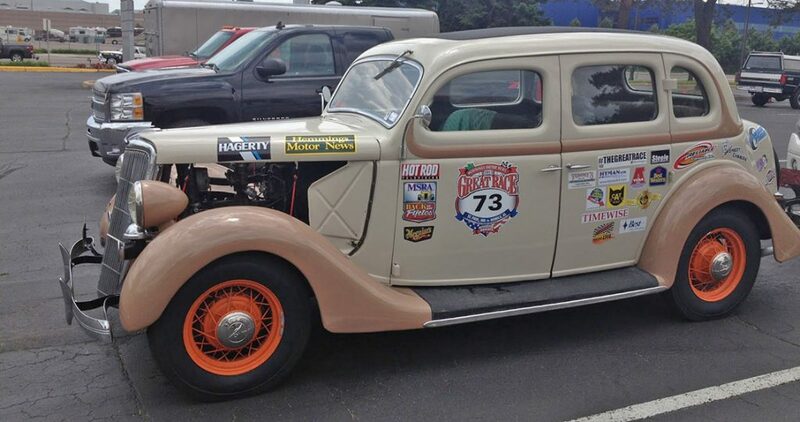 In the 2017 Great Race a 1932 Ford won the event from Florida to northern Michigan. The 2019 winners will again receive $50,000 of the $150,000 total purse. 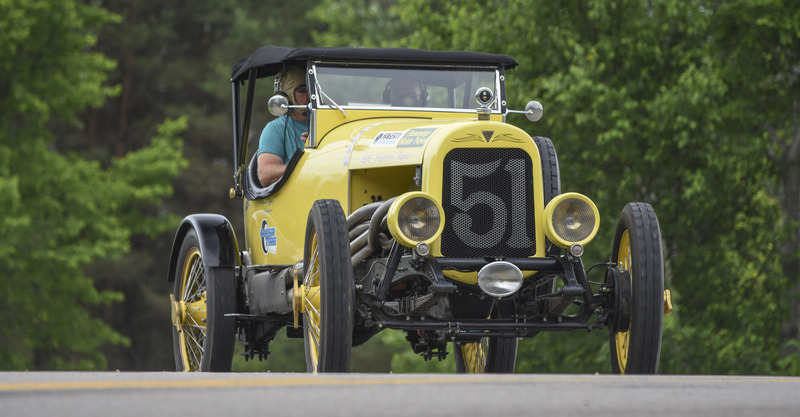 A 1916 Hudson Pikes Peak Hillclimber, a 1916 Chevrolet Phaeton, a 1917 Peerless Racer and a chain-driven 1918 American LaFrance Speedster are the oldest cars scheduled to be in the 2018 Great Race from Buffalo, N.Y., to Halifax, Nova Scotia. Over the decades, the Great Race has stopped in hundreds of cities big and small, from tiny Austin, Nevada to New York City. The event was started in 1983 by Tom McRae and it takes its name from the 1965 movie, The Great Race, which starred Tony Curtis, Jack Lemmon, Natalie Wood and Peter Falk. The movie is a comedy based on the real life 1908 automobile race from New York to Paris. In 2004, Tony Curtis was the guest of the Great Race and rode in his car from the movie, the Leslie Special. The Great Race gained a huge following from late night showings on ESPN when the network was just starting out in the early 1980s. The first entrant, Curtis Graf of Irving, Texas, is still a participant today. The events main sponsors are Hemmings Motor News, Hagerty, Coker Tire and Reliable Carriers. For more information, go to www.greatrace.com or contact Jeff Stumb at [email protected] or by calling him at 423-648-8542. Are you stopping in Grants Pass, Or. Would love to see all those cars. How can the Southern Oregon Corvette Association help your show? Could we assist in parking or some other function that you need help with? I became involved with Greatrace in 1983 an ran my first one in 1984. I was hooked and returned 1987 thru 1995 and then came back again as a tourist class navigator in 2001. Since then I’ve followed them all, encouraging all antique car folks to get involved in the Adventure of a Lifetime. “If you don’t drive your antique cars, you might as well collect clocks” is still my motto. I was fortunate enough to join the first race in 1983 with a 1941 Packard 160 sedan. This Packard served as a staff car at Fort Lewis, WA. during World War Two. The staff numbers were still under the hood. I bought the car at a local car auction for under $2,500. The Great American Race was on my mind and I needed a car to compete as at that time the cars had to be 1941 or older. I had the Packard painted back to Khaki green and bought clothes and helmets to enter the race as Generals! The draw of sending $5,000 entry fee was the fact of driving around the Indy speedway the day before the Indy 500 Race!! 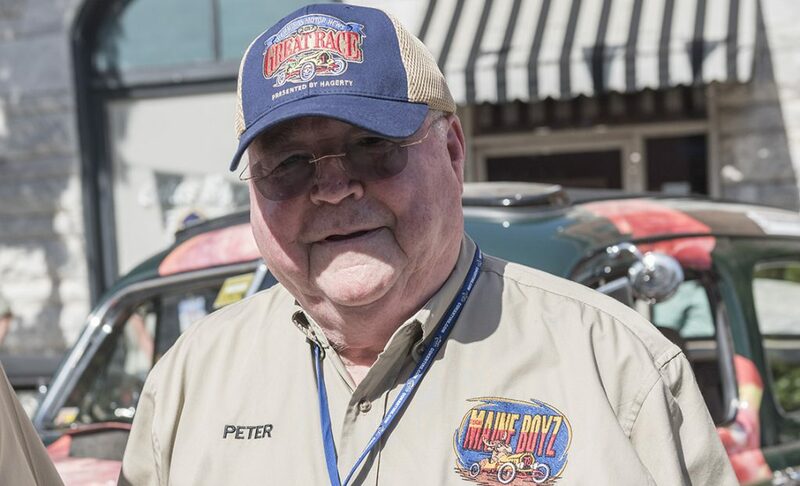 I have had the privilege of entering the Great Race five times – four times in my 1932 Model PB Plymouth and once in a 1936 Buick Century. Theres really nothing to compare if you enjoy driving your vintage car. The Great Race organization are consummate professionals. The participants become like family members. Highly recommended! The June 25 leg of the journey is from Chico, CA to Eureka, CA, with a lunch stop at Ukiah. I assume that this will be over the most direct and scenic route, California State Route 20 between Williams and Calpella/Redwood Valley, skirting the north shore of Clear Lake, California’s largest natural lake (Lake Tahoe is partly in Nevada) and one of the oldest lakes in North America, with volcanic Mt Konocti looming over its south shore. This will be great for me, as I live in nearby. Are the people planning the itinerary aware that Ukiah is about 6 miles out of the way for travel from Upper Lake to Willits, adding 12 miles of driving over the same stretch of freeway? Don’t get me wrong, Ukiah is a nice little town and Todd Grove Park on the west side of town is great place for groups to gather, but I’m sure lunch could be obtained in Lucerne, Nice (the Robinson Rancheria Casino has a huge parking lot and a fine restaurant), or Upper Lake or further up the road in Willits, saving both time and a several miles of dreary freeway driving. I am thrilled that the 2019 Great Race is starting in Riverside. I live in Riverside and have followed the Great Race since it’s inception. My Dad always dreamed of entering, but unfortunately never got the chance before he passed. Can someone tag along, like from Riverside to Chico. I have a 1946 Chevrolet that could make that trip. My 1931 Pierce Arrow ran in the very first Great Race in 1983, still have all the magnets and quite a few of the decals still on the car. It will be there in Tacoma this year to see the racers off. Will you be driving through Wilsonville, Oregon? We would love to see you at the World of Speed Motorsports Museum! When will the race be going to Gardnerville, NV? 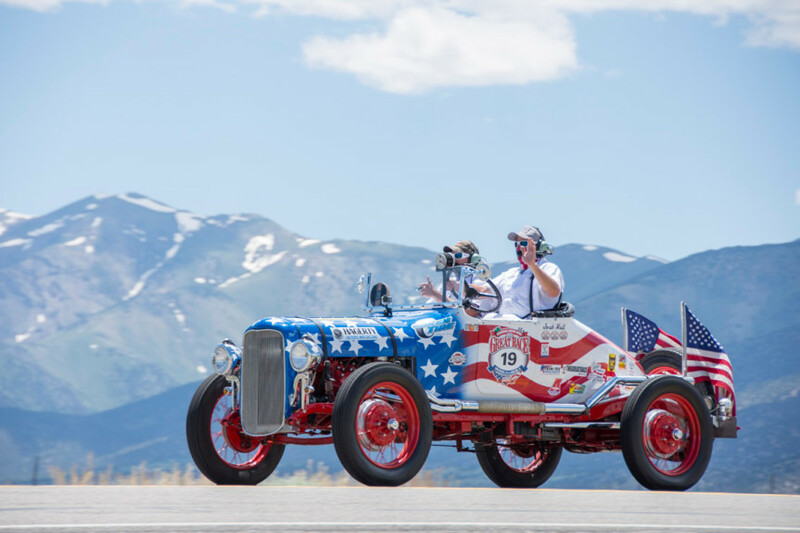 The Great Race will be in the Carson Valley on Sunday, June 23rd 2019. Do not want to give out to many details but it is shaping up to be spectacular! Please feel free to contact the Carson Valley Visitors Authority for additional information. I live in Gardnerville so feel free to contact me as well. Excited that you are coming through Bend. What night will they be here? Looking forward to seeing you all in Bend. What’s your day of arrival? The Great Race will stop overnight in Bend on Thursday, June 27, on Wall Street near the Tower Theater. Where will you be staying in Grants Pass, Oregon? The Rouge River Classic Cruisers club would like to know. The Great Race will stop overnight in Grants Pass on Wednesday, June 26. Can you tell me on what date the over night stay will be in Bend Oregon? Thanks for you help. Where in Riverside can we see the cars before the start of the race? On Mission Inn Avenue directly in front of the Mission Inn (between Lemon and Market streets). What time Sat. does the race start and is there a location to view the cars the day before the race. Thanks for your previous response. The cars will line up starting at 8:30 a.m. on Saturday, June 22, on Mission Inn Avenue between Lemon and Market (right in front of the Mission Inn). The show will start at 10:30 and the first car will leave at 11 a.m. A new car will leave every minute so the last car should be gone by 1 p.m. I witnessed the start of the 1994 Great American Race at the pier in Huntington Beach, CA when it ran to Wilkes-Barre, PA. Since I still live in Huntington Beach I will have several opportunities to see it this year. Is there a detailed map of the route available to spectators or do just the participants get these? If available, how can I get one. Where can we view the cars in Eureka, Ca? Second Avenue in Old Town. You will need to fill out the waiting list form which is at http://www.greatrace.com/waitinglist. Hi, Would love to have you stop at our 50’s style Restaurant in Longview, WA. I will do up some cool specials for all who make the trip. My Restaurant is called Stuffy’s ll Restaurant. Check out our website and let me know if I can email you some great specials for your event. Our CC “Highlakes Car Club’ in LaPine, OR. will definitely want to see you all in Bend…and we usually plan a road trip to Crater Lake quite often so just might drop in and run with the tour into Bend if possible. I read you are in Grants Pass night of 26th so would assume a lunch stop at Crater Lake with some time for pictures and such then on to Bend for the evening. Hwy 97 to Hwy 58 the the cutoff to Cascade Lakes hwy around Mt. Bachelor into Bend if I’m not mistaken ?.. My team participated in the 2007 race in my 1957 Chevy Belair, which was the last coast to coast run. Team “Smooth and Sassy” will group together at my house in Grants Pass to welcome the current race into town and send them off the next morning. Really excited to meet all the new entries and share some stories. Hey, is Bob Marak going to be there with his 60’s Bug? Ragtop. How do you get registered for future races? like the one in 2020? Requirements,etc?